This certainly can be a challenge in today’s world, which often feels so volatile and deeply divided — especially in social media spaces where the full spectrum of perspectives, opinions, ideas, and personalities is constantly churning around and bumping into one another. Sometimes, the social media space can really bring out the worst in people. Sometimes, it feels like the whole internet is just waiting to pounce on one another. Whenever these elements are present, communicated, and shared online, I believe that the Spirit of God is at work in and among us. In those moments when we communicate love, share in one another’s joy and sorrows, when we are voices for peace and understanding, and when we are generous with our time and attention (and in our opinions of others), those, for me, are like seeing the fingerprints of God move across my screen. These gestures may or may not be overtly Christian, but it is clear to me they come from a heart of Christian concern. And the final fruit of the Spirit is key to life online — using self-control to determine whether what we share is for building up or breaking down, for helping or harming, for building understanding or creating division, for self-promotion or encouraging others. In a brief, mindful, perhaps even prayerful moment before pressing “post,” “send,” or “publish,” we can avoid causing injury to others (and ourselves) and shine a light into our digital world. One of the pitfalls of life online is that people are constantly trying to convert one another to another different perspective, opinion, or belief system. There is a meme going around now that says something like this: “Boy, that exchange on Facebook I had yesterday really changed my mind. Said no one ever.” In fact, studies show that people’s minds are rarely changed by these digital interchanges. In my experience, it is much more helpful to approach our relationships and encounters online with a spirit of reconciliation rather than conversion. Before seeking to change or convert others, we must first listen, understand, and seek to reconcile. Rather than rushing to convert the others, be it to a cause, party, or religion, we should instead help to create safe space and common ground for people to engage. It is within these safe spaces that durable relationships develop, over time allowing the work of reconciliation and perhaps, then, conversion to occur. By our witness and Spirit-inspired presence online, we can model something better and deeper. I believe this is one of the most important things churches and believers can be doing online and offline today — helping people to listen, understand, and see one another. We often turn people into one-dimensional caricatures. We define them by their political party, by that one thing they did to us years ago, or by their last social media post. People, of course, are far more complex and interesting than that. We need to listen to their stories and share stories of our own, not for the sake of conversion, but reconciliation and understanding. 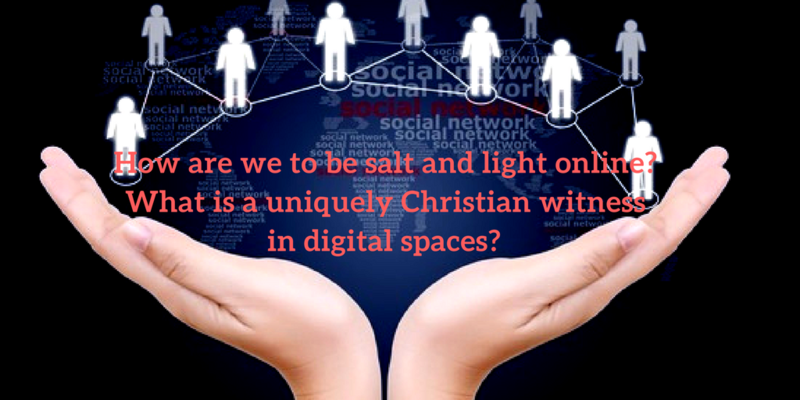 By our witness and Spirit-inspired presence online, we can model something better and deeper. Like a stone tossed in a still pond, every small act of kindness matters and creates more digital ripples of goodness than we can imagine.